This article first appeared in City & Country, The Edge Malaysia Weekly, on January 8, 2018 - January 14, 2018. The office market in Kuala Lumpur — which comprises KL City and KL Fringe — and Beyond KL (Selangor) was sluggish in 3Q2017 as net absorption remained low while supply stayed high. “We observed a relatively quiet period for absorption as some companies continued to optimise office space. Absorption of office space is calculated based on the difference between total office space occupied during the quarter and the previous quarter,” says Knight Frank Malaysia managing director Sarkunan Subramaniam in presenting The Edge/Knight Frank Klang Valley Office Monitor (3Q2017). “This growing mismatch continues to exert pressure on overall rental and occupancy levels in KL City and KL Fringe,” he says. “Newly-launched co-working space provider, Colony, has raised RM8 million for its expansion in two more locations targetting Mid Valley City and Sunway City. Common Ground plans to open three more venues — Mont’Kiara, Taman Tun Dr Ismail and Kuala Lumpur City Centre — following the success of its first venue in Damansara Heights,” adds Sarkunan. “3Q2017 continued to be a strong tenant’s market with no major changes in the office market’s performance,” he adds. Demand for well-located, good grade, dual-compliant office buildings is expected to remain firm. “Dual-compliant buildings that come with MSC status and green accreditation may continue to be in good demand. 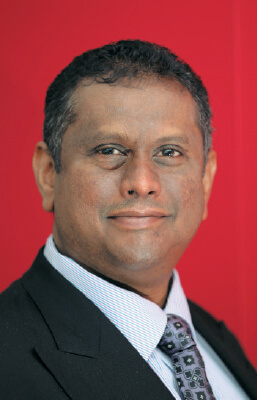 Leasing activities in sectors such as shared services and e-commerce have been positive,” says Sarkunan. “Old and dated buildings may struggle to survive in the current challenging office market … unable to compete with new office buildings that offer modern building specifications and value-added features such as green accreditation and MSC status,” adds Sarkunan. “And with reasonable yields [in comparison with other regional countries], well-located, good grade office buildings will continue to attract investors’ and fund managers’ interest. “Investors are seeking prime office buildings that come with attractive yields ranging from 6% to 6.5% per annum, especially REITs, sovereign wealth funds and institutional funds. Recent transactions involving office buildings in Kuala Lumpur are AmanahRaya REIT’s purchase of Vista Tower and Kumpulan Wang Persaraan (Diperbadankan)’s purchase of Integra Tower and Menara Cap Square. Moving forward, office supply in KL City and Beyond KL is projected to increase significantly and by 2019, the cumulative stock is expected to breach the 110 million sq ft mark (an 11.3% increase between 4Q2017 and 2019). The bulk of new completions will be in KL City (41%), followed by Beyond KL (35%) and KL Fringe (24%). Scheduled completions in 4Q2017 — namely JKG Tower in Jalan Raja Laut, Menara Suezcap 2 @ KL Gateway in KL Fringe and Block J @ Empire City in Selangor — will add 1.19 million sq ft of office space to the current stock (99.73 million sq ft). Quarter on quarter, occupancy rates for offices in most areas of KL remained stable. “Similarly, in the locality of Mid Valley City/Bangsar/Pantai, average occupancy dropped noticeably despite new take-ups due to the entry of new stock Tower 3 of KL Eco City with an estimated net lettable area (NLA) of 418,000 sq ft,” explains Sarkunan. The overall occupancy rate dipped 0.1% to 80.1% in KL City. In the Golden Triangle, it maintained at 79.2% while in the central business district (CBD), it dipped 0.4% to 85.3%. 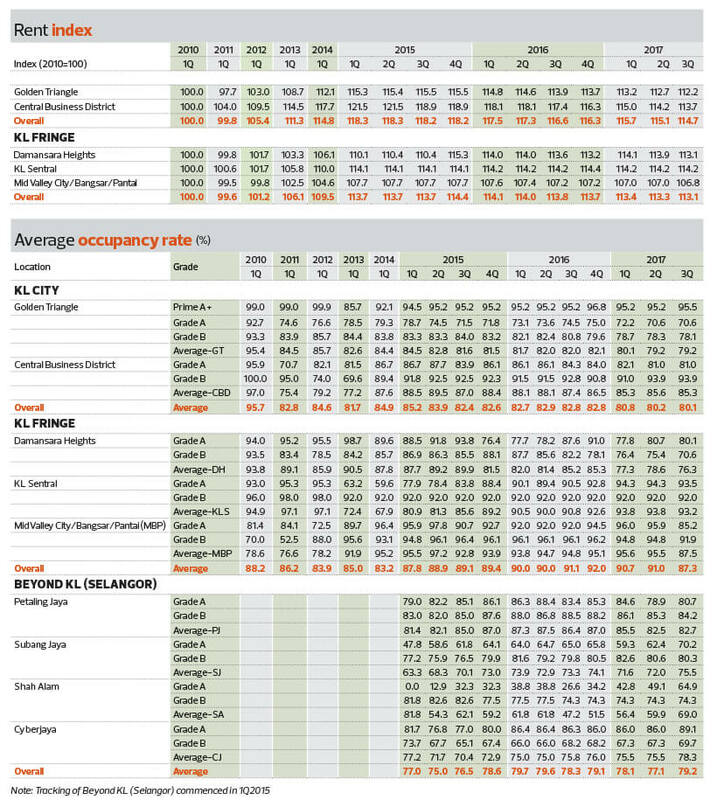 In KL Fringe, there was a noticeable drop in average occupancy rates, especially in MVC/Bangsar/Pantai (-8.4% to 87.5%) and Damansara Heights (-2.9% to 76.3%). “The average occupancy rate in Damansara Heights recorded a slight drop during 3Q2017 following tenant movements in several office buildings such as Wisma UOA Damansara 1, Wisma UOA Damansara 2 and HP Towers,” says Sarkunan. In Beyond KL, the overall occupancy rate improved 2.8% to 79.2%. In Petaling Jaya, it rose 0.3% to 82.7%. In Subang Jaya and Shah Alam, it rose 4.9% and 15.0% to 75.5% and 69.0% respectively. In Cyberjaya, it rose 3.6% to 78.3%. “The average occupancy rate for the Petaling Jaya Commercial District declined from 91.3% in 2Q2017 to 90.0% in 3Q2017 following tenants moving out of Tropicana City Office Tower, PJ33 (formerly Jaya 33) and Wisma LYL. Meanwhile, in Ara Damansara/Tropicana/Kelana Jaya, the average occupancy rate inched up marginally to 77.3% following improved take-up in The Ascent @ Paradigm. During the period under review, the overall average occupancy rate for the Petaling Jaya locality was flat at 82.7% (2Q2017: 82.5%),” says Sarkunan. “In Subang Jaya, the overall occupancy rate was marginally up from 72.0% to 75.5%. This follows the positive take-ups in SunGeo Tower as well as Towers 2 and 4 of Puchong Financial Corporate Centre (PFCC). In Cyberjaya, the overall occupancy rate also improved marginally to 78.3% with new take-ups in several buildings, such as Wisma Mustapha Kamal, Quill 18 (Block B) and Bangunan Emerio,” explains Sarkunan. 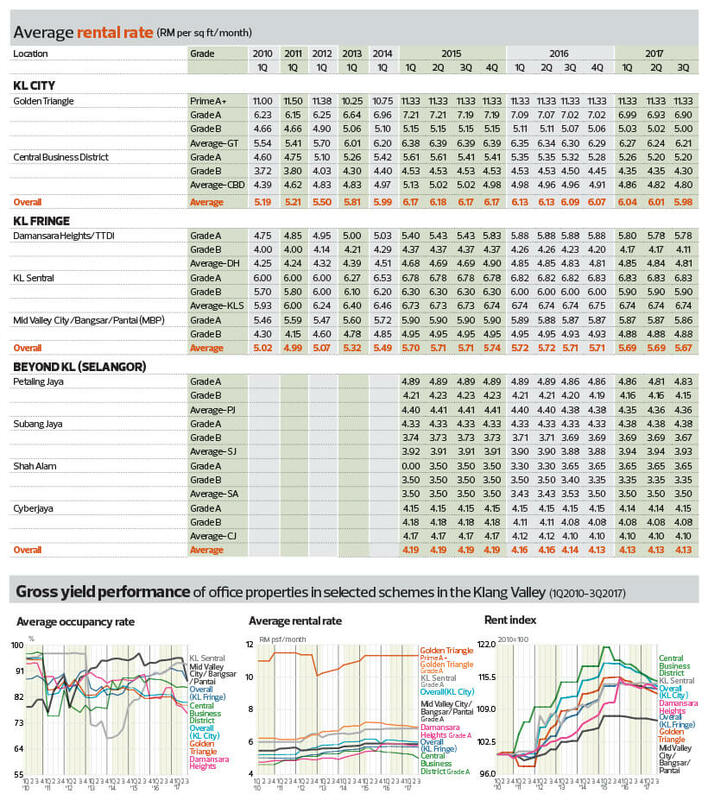 Meanwhile, rental rates for offices in KL City declined marginally. The overall rental rate in KL City slid 0.42% to RM5.98 psf. Golden Triangle Grade A rental rates dipped 0.4% to RM6.90 psf while Prime A+ remained unchanged at RM11.33 psf. CBD Grade A rents also remained unchanged at RM5.20 psf. In KL Fringe, the overall rental rate fell 0.26% to RM5.67 psf. Rental rates remained the same for Damansara Heights Grade A and KL Sentral Grade A offices at RM5.78 psf and RM6.83 psf respectively. MVC/Bangsar/Pantai Grade A dipped 0.2% to RM5.86 psf. In Beyond KL, the overall rental rate declined 0.02% to RM4.13 psf. In Petaling Jaya and Subang Jaya, it dipped 0.04% and 0.23% to RM4.36 psf and RM3.93 psf respectively. Shah Alam held steady at RM3.50 psf while Cyberjaya increased 0.07% to RM4.10 psf.